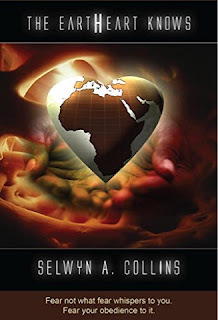 Selwyn Collins's book, "The eartHeart Knows" is essentially a journey, as the author puts it, "a journey of discovery". And while it represents the author's journey, it is or can be every person's journey. As such, the book is an invitation, an invitation to participate on that journey. And what a journey it is indeed. The reader who suspends judgement as he or she participates on this journey cannot be the same by the journey's end. Along the way is the encounter with the Divine, a struggle to understand the Divine, to understand the nature of the individual's relationship with the Divine, and most important of all to understand the self. The book also assumes and is premised on the possibility of happiness while acknowledging the necessary challenges along the way in the pursuit of that happiness. The essential message (and a rather powerful one too) of "The eartHeart Knows" is that the individual (I Am) is Love, Peace, Joy, Courage, and that the individual (I Am) is worthy of Love. A careful reading and examination of the book will make this obvious. This is not a book to be read in a cursory manner or to be read in one sitting. It is as rich as pure honey is rich and as such should be taken in small portions, digested, and ruminated upon. It can be read sequentially and can also be opened to any page and read randomly. Reading it in the latter manner will not an any way compromise the essential message to be gleaned therein. In addition, this is a book which pages can be read over and over and over again without the words and message becoming meaningless by virtue of repeated readings. The gems you will find therein will never grow stale. Such is the power of Selwyn Collins's book. Mr. Collins definitely has a way with words. He is like the eloquent and golden-mouthed John Chrysostom. His words of wisdom are not only such, pregnant with wisdom, they are also richly poetic. There is a beauty and an elegance in the construction of the words and thoughts in the book, placing it not only in the genre of Inspiration but also in the genre of Poetry. As an inspirational book it certainly serves to uplift the human individual and does so in excellent fashion. One cannot walk away from an encounter with this book or with the words in this book and not be moved to seriously pause and consider his or her relationship to self, to others, to the world, or to the Divine. It not only uplifts and inspires, it also challenges the reader. And the choice is always clear, and the way to make that choice given with gentleness, understanding, and with the recognition that despite our inherent weaknesses we are certainly capable of improving ourselves.